, an Italian poet, and poetical historian, the son of John Philip Crescimbeni, a lawyer, and Anna Virginia Barbo, was born Oct. 9, 1663, | at Macerata in the marche ofAncona. Jerome Casanati, afterwards cardinal, was his godfather, and gave him the names of John-Maria-Ignatius-Xavier-Joseph-Antony, of which he retained only John Maria, and afterwards changed the latter into Mario. After receiving grammatical education at home, his uncle Antony-Francis, an advocate, invited him to Rome in 1674; hut the following year his father and mother recalled him to Macerata, where he engaged in a course of study among the Jesuits. His teacher of rhetoric was Charles d’ Aquino, under whom he made great progress in eloquence and poetry. 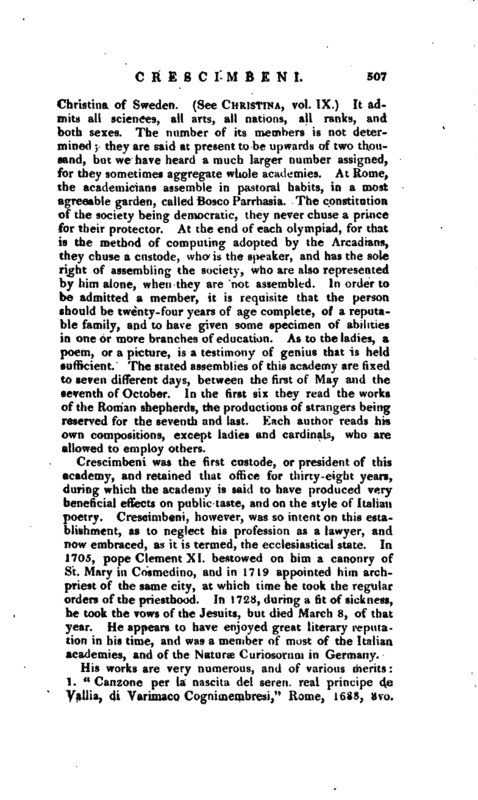 Among his early attempts, he wrote a tragedy in the style of Seneca, “The Defeat of Darius, king of Persia,” and translated the first two hooks of Lucan’s Pharsalia into Italian verse from which performances he derived so much reputation, as to be admitted a member of the academy of the Disposti, in the town of Jesi, although only in his fifteenth year. About that time he continued his classical studies for eight months under Nicolas Antony Raffaelli, and entered upon a course of philosophy. His father now recommending the law as a profession, Crescimbeni took his doctor’s degree Oct. 3, 167 y, and was appointed to lecture on the institutes, which he did for a year. 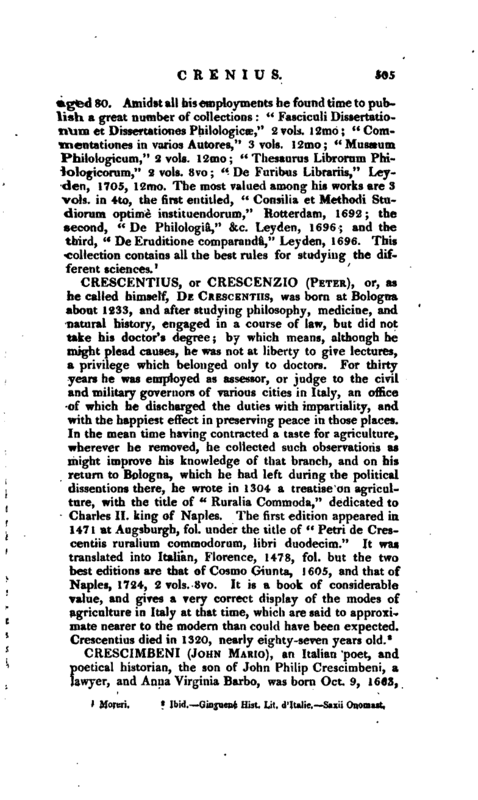 His uncle before mentioned, aoain inviting him to Rome, he divided his time there between law and polite literature, and in 1685, the academy of the Infecondi admitted him a member. 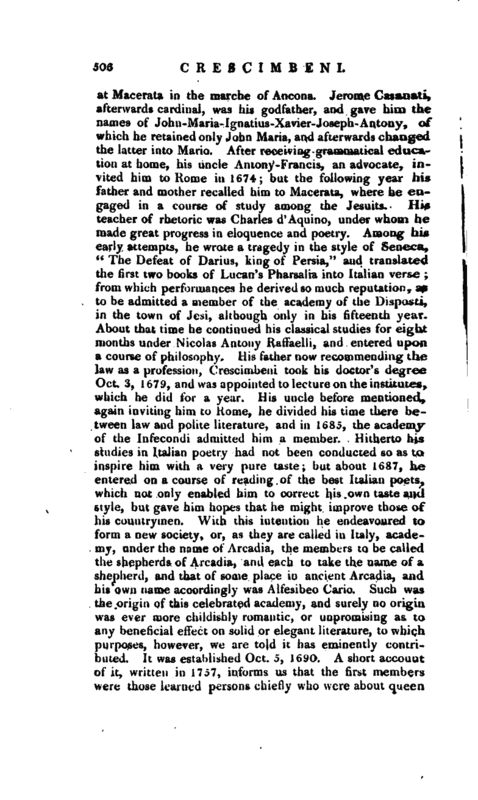 Hitherto his studies in Italian poetry had not been conducted so as to inspire him with a very pure taste; but about 1687, he entered on a course of reading of the best Italian poets, which not only enabled him to correct his own taste and style, but gave him hopes that tie might improve those of his countrymen. With this intention he endeavoured to form a new society, or, as they are called in Italy, academy, rindcr the name of Arcadia, the members to be called the shepherds of Arcadia, and each to take the name of a shepherd, and that of some place in ancient Arcadia, and his own name accordingly was Alfesibeo Cario. Such was the origin of this celebrated academy, and surely no origin was ever mure childishly romantic, or unpromising as to any beneficial e licet on solid or elegant literature, to which purposes, however, we are told it has eminently contributed. It was established Oct. 5, 1690. A short account of it, written in 1757, informs us that the first members were those itained persons chiefly who were about queen | Christina of Sweden. (See Christina, vol. IX.) It admits all sciences, all arts, all nations, all ranks, and both sexes. The number of its members is not determined; they are said at present to be upwards of two thousand, but we have heard a much larger number assigned, for they sometimes aggregate whole academies. At Home, the academicians assemble in pastoral habits, in a most agreeable garden, called Bosco Parrhasia. The constitution of the society being democratic, they never chusje a prince for their protector. At the end of each olympiad, for that is the method of computing adopted by the Arcadians, they cbuse a custode, who is the speaker, and has the sole right of assembling the society, who are also represented by him alone, when they are not assembled. In order to be admitted a member, it is requisite that the person should be twenty-four years of age complete, of a reputable family, and to have given some specimen of abilities in one or more branches of education. As to the ladies, a poem, or a picture, is a testimony of genius that is held sufficient. The stated assemblies of this academy are fixed to seven different days, between the first of May and the seventh of October. In the first six they read the works of the Roman shepherds, the productions of strangers being reserved for the seventh and last. Each author reads his own compositions, except ladies and cardinals, who are allowed to employ others. 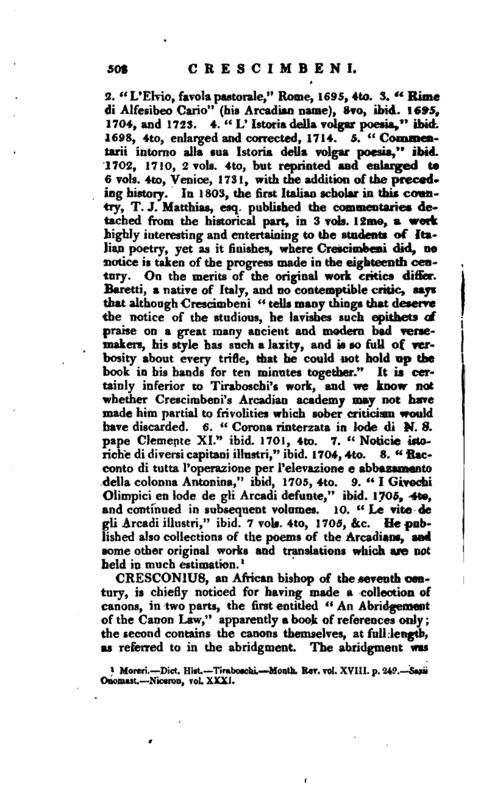 Crescimbeni was the first custode, or president of this academy, and retained that office for thirty-eight years, during which the academy is said to have produced very beneficial effects on public taste, and on the style of Italian poetry. Crescimbeni, however, was so intent on this establishment, as to neglect his profession as a lawyer, and now embraced, as it is termed, the ecclesiastical state. In 1705, pope Clement XI. bestoweu on him a canonry of St. Mary in Cosmedino, and in 1719 appointed him archpriest of the same city, at which time he took the regular orders of the priesthood. In 1728, during a fit of sickness, he took the vows of the Jesuits, but died March 8, of that year. He appears to have enjoyed great literary reputation in his time, and was a member of most of the Italian, academies, and of the Naturae Curiosorutn in Germany. 1 Moreri.—Dict. Hist.—Tiraboschi. Month. Rev. vol. XVIII. p. 249.—Saxii Onomast.—Niceron, vol. XXXI.